There have been a lot of these riffs on the government WW2 "Keep Calm and Carry On" posters over the past few months. Or ... 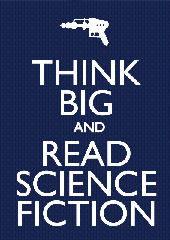 Think bigger and write it? Thanks, all. I don't know why it's just posted a tiny version of the poster here, it looks much better full-size. The image is mainly a response to China Mieville's "The City & The City", which I'm reading at the moment. There aren't any ray guns in it but it's one of those books that you just look at and think, "How did he come up with an idea like that?" Inspiring and depressing in equal measure. It's a great read, by the way. Chloe, I looked into the 77-7-7 thing and although I'm not entirely sure what it's for, I might have a go at it. I'm pretty sure my (currently) abandoned SF novel has more than 77 pages. Stay tuned!